Okay, I weighed myself and lost two pounds, I lost 1/2 inch on my waist and my shoes fit loosely. I was worried since I did not see much progress on the scale earlier (I had only lost one pound before) although my clothes started fitting more comfortably. I am encouraged to continue this journey of finding the lighter side of me. This is a "High Potassium" day. Yay! I have waited for this day to eat all the fruit I want to eat, Yay!!! The program says I can eat up to eight bananas but I used other fruits instead and I replaced the skim milk with cottage cheese, cheese and yogurt. To view which other fruits are high in potassium go to Moms Who Think. 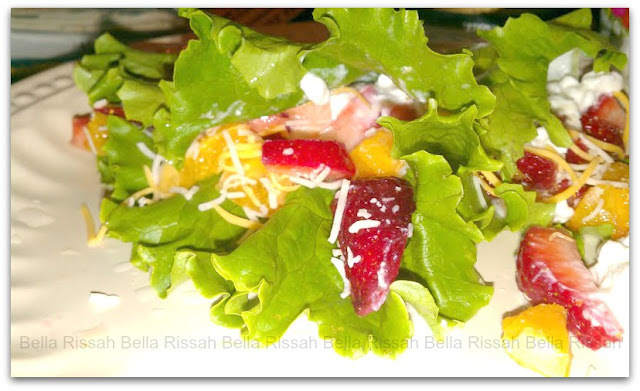 Green leaf lettuce, low fat cottage cheese, cubed orange, sliced strawberries, with shredded cheese. One cup of coffee broth. Lunch: 1 1/2 C. of mixed fruit mixed with low fat plain Greek yogurt. Kiwi, blueberries, strawberries, apple, and orange. Dinner: Cabbage soup topped with shredded cheese and crushed red chilies. Snack: 2 string cheese packages. 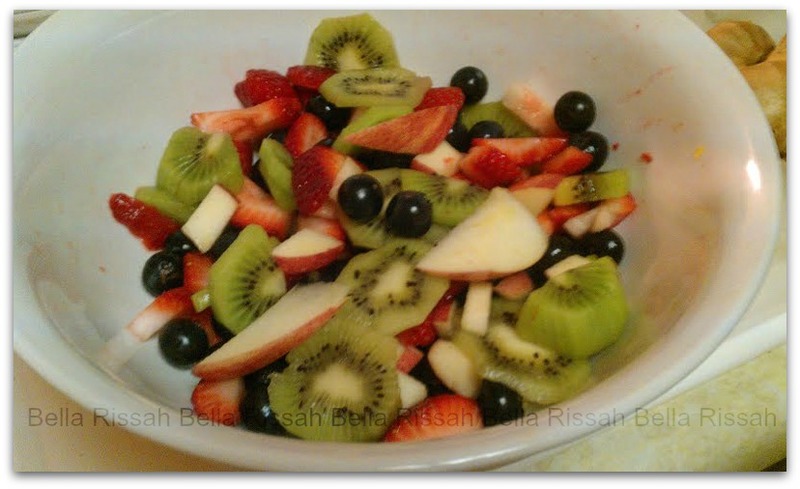 The potassium content in one banana has 422 mg. Times that by the allowed number of bananas, it comes to 3376 mg. As I stated above, I used other fruit instead: 1 C/ blueberries, two large oranges cubed, eight strawberries sliced, two kiwi sliced, 1/2 medium size Gala apple, and one lettuce leaf. Even with all this, I only achieved a potassium intake of 1285 mg. But it was very filling and satisfying. I was pleased to see I lost two pounds. I am really enjoying the morning cup of the heated broth and am thinking of taking extra to work with me. This was such a good day. Thank you for stopping by for a visit.